After years of touring various festivals and cities across the UK, the smash-hit spectacular Showstopper! The Improvised Musical has finally come to London for a well-deserved run at the Apollo Theatre. Having already seen the all-singing, all-dancing troupe of improvisers twice before, I was so excited to see them again, as no other musicals can guarantee a completely new and original show every time you see them. The premise of Showstopper is that the cast craft a completely unique, one-off musical based around suggestions from the audience, which sounds potentially disastrous. In fact, it is actually a stroke of genius. Co-creator Dylan Emery frames the show, acting as an onstage narrator who picks up the phone to “Cameron” (who we can only presume is Mr Mackintosh), a producer who is desperately seeking a new show. Emery asks the audience for suggestions on musical numbers, setting and a name for the show – I saw ‘Making Sparks,’ a musical based on the opening of Marks and Spencer in 1884, with numbers inspired by Dreamgirls, Into the Woods, Avenue Q, The Book of Mormon and interestingly, AC/DC. 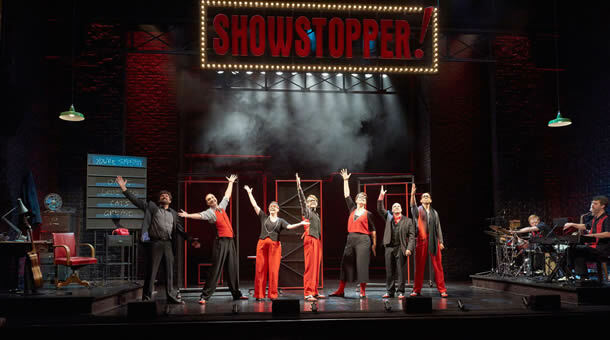 The Showstopper cast are hugely entertaining and are absolutely switched on from start to finish. The amount of teamwork and connection that improvising requires is immense, and this cast are fully engaged at all times. This particular show featured fellow co-founder Adam Meggido, Pippa Evans, Andrew Pugsley, Oliver Senton, Sarah-Louise Young and, my favourite, Ruth Bratt. Not only does the show change each time, the cast and very talented band, which is headed by musical director Duncan Walsh-Atkins, also switch around. Even the technical team are improvisers! Showstopper will have you in hysterics from start to finish, but never actually plays for laughs, which is often the danger of improvisation. Beautiful one-liners are interspersed throughout the shows, especially from Bratt, who created jam-maker Petunia and bumbling Prime-Minister Gladstone. Young was also a stand-out performer, playing the heroine Polly, and it was actually her vocals and quick-off-the-mark lyrics that were impressive. This is very much an ensemble-driven musical, with all of the performers playing off each other and working together to create believable scenes and musical numbers. Emery often pauses the scenes to ask the audience for more suggestions, and a particularly hilarious moment was the confrontation of Mr Marks and Mr Spencer, featuring Meggido, Senton and Pugsley performing in the styles of Pinter, Brecht and Beckett. The performers’ ability to quickly switch between styles is remarkable and it simply demonstrates their expansive knowledge of the theatrical world. Some stand-out moments have to be the AC/DC inspired love song, delivered by Pugsley and the ensemble, which was hysterical whilst being extremely impressive. The Gilbert and Sullivan inspired opening number in Act Two was such a treat, once again showing a cast that is hugely diverse. It was particularly amusing when Emery paused the scene and demanded the cast sing a song entirely in unison, which they actually managed for a whole four verses. It is often speculated that Showstopper must have some sort of framework to follow, but after seeing the show a few times I can vouch for the fact that they really do improvise on the spot, although you really would never know it. Their West-End run is hugely deserved, and the fact that they received a standing ovation from the entire audience is very telling. I saw their 619th new show, and one of 80 that they will perform as part of their run at the Apollo. I urge everyone to see Showstopper, not once, but several times!